It’s not often that buried treasure is discovered in Ottawa. But the Lilias W. Fleck fountain, which once graced a small park at the north end of Bronson and provided drinking water for “man, horse, and dog,” was moved, then lost — perhaps even demolished by vandals. Rediscovered during soil work in advance of development in Lebreton Flats, the fountain is undergoing a makeover, and the NCC plans to reinstall it. This time, however, it may quench the thirst of man, woman, and Sens fan. In February 2013, crews uncovered eight pieces of the fountain. Archaeological experts were called in and laid out pieces of the puzzle: a large cylinder, a capstone, a large grey granite bowl, a bell-shaped pedestal, and four curved pieces. After piecing it back together, forming a curved partial wall around the fountain with the U-shaped pieces, NCC researchers believe they have 88 percent of the original fountain. Missing? The base of the pedestal, a decorative finial, and a segment of the curved wall. Etched into the cylinder is the dedication “In loving memory of Lilias W. Fleck + erected by her children.” Born Lilias Ingles Walker, the wife of wealthy businessman and Vulcan Iron Works founder Alexander Fleck mothered six children. In fact, her daughter, Lilias Mackay Fleck, married Thomas Ahearn, a key figure in the city’s industrial ventures and the first chairman of the Federal District Commission, the predecessor to the NCC. The fountain was erected in 1892, two years after the death of this founding mother. The NCC plans to erect the restored fountain near Booth Street and Sir John A. Macdonald Parkway this year as a link to prominent builders of Canada’s capital. Indeed, it’s not hard to imagine the water from that fountain representing the life-giving stream of mothers, whose contribution to the city is often ignored or forgotten by historians. 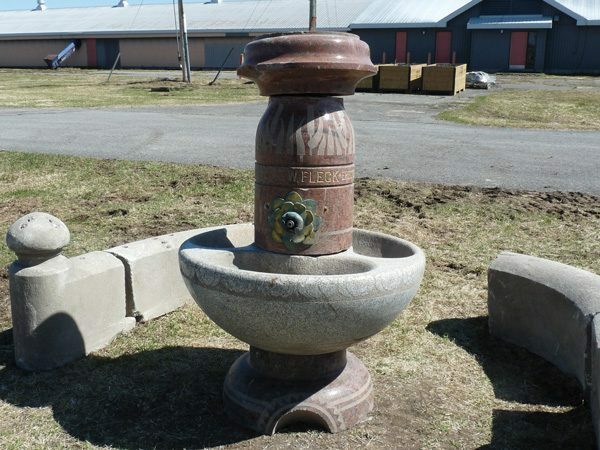 Though with all the chatter about relocating the Sens to Lebreton Flats, it’s easy to see poor Lilias’ fountain once again being lost in the shuffle.